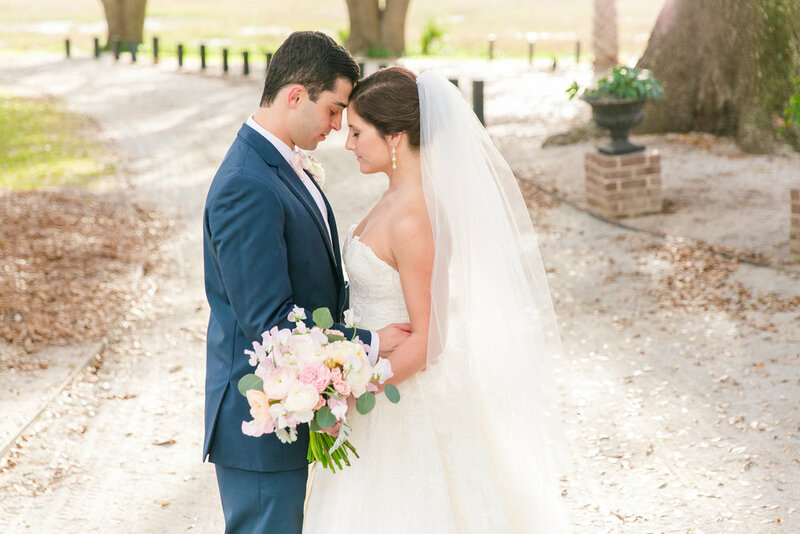 Katie and Jesse’s Lowndes Grove Plantation Wedding was the perfect venue to host the best day of their lives. 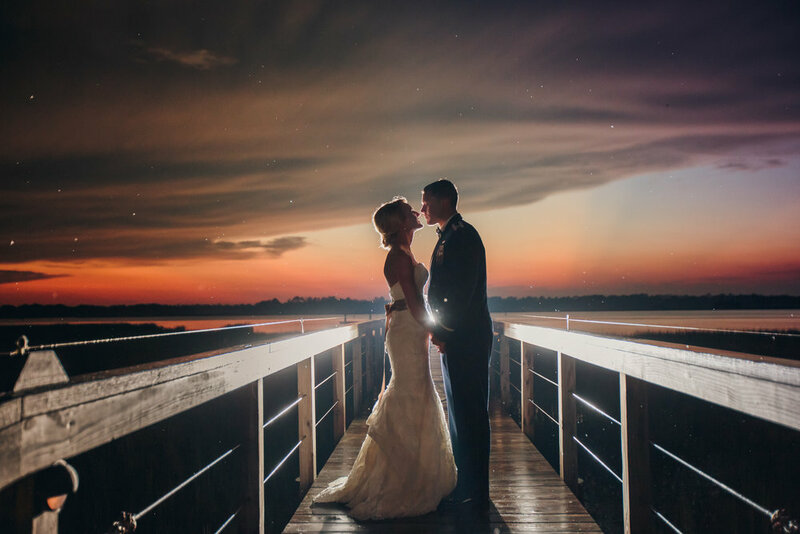 After getting ready, the couple met on the walkway to the dock for their intimate first look captured by Aaron and Jillian Photography. 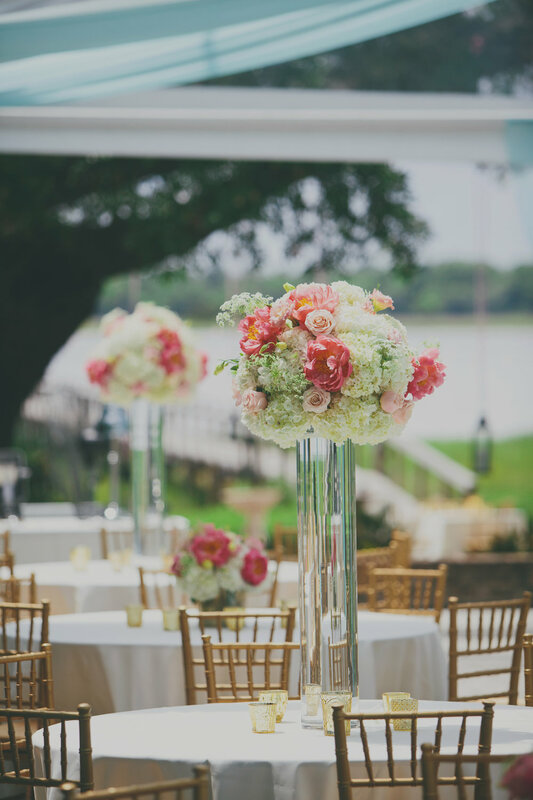 Lowndes Grove Plantation is a beautiful venue due to its location tucked away on the waterfront with the classic style oak trees on the front lawn and a historic home on the property. 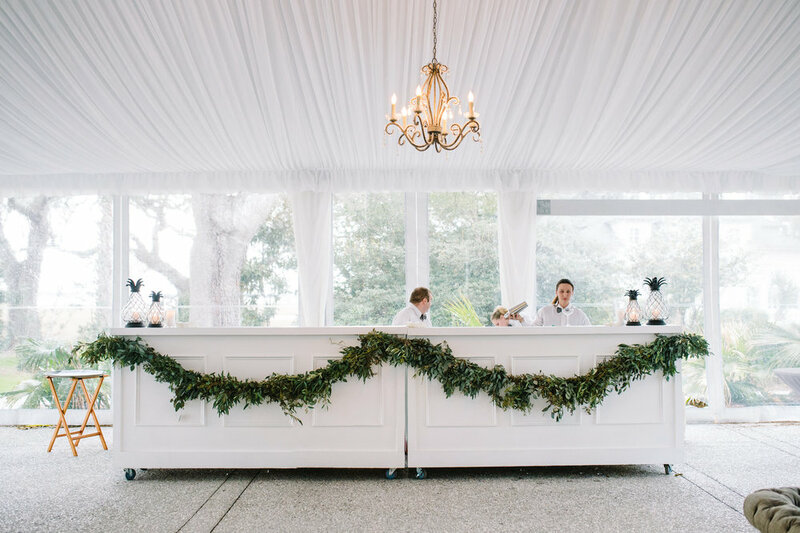 The tent was full of cafe lighting and chandeliers with neutrals and accents of jewel tones for a gorgeous fall wedding. The couples sweet pup even decided to make an appearance for the wedding day and for some adorable photos! See all the pretty details below! Haley + Jeff had a beautiful Lowndes Grove Plantation wedding. Haley was a true Pure Luxe Bride, incorporating sparkle into her wedding any chance she had. Her tent shimmered with blush pink and accents of silver. The poles were disguised in a soft pink drape, and glittering linens covered the cocktail tables. 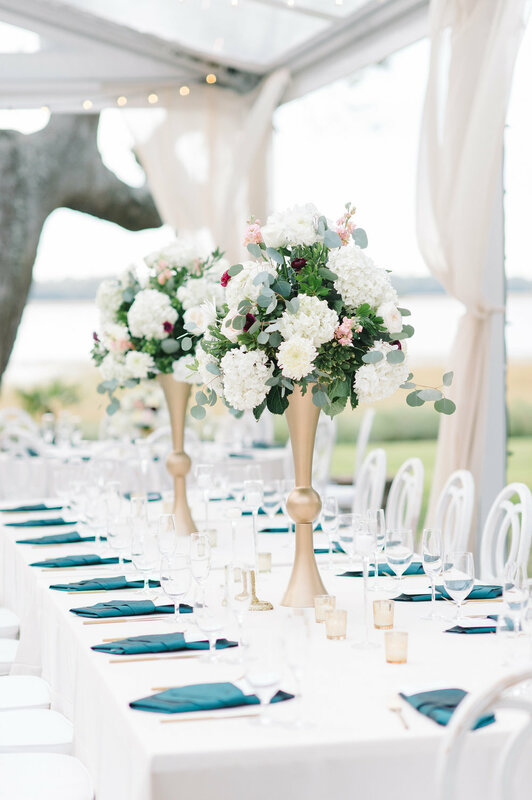 The floral combinations from Branch caught the attention of all the guests with a combination of white hydrangeas, silver dollar eucalyptus, roses, and dusty miller in a mercury glass vase stole the show. The bride carried a bouquet of white O'Hara garden roses and peonies tied with a ribbon to match her gown.She looked stunning in her uniquely beaded dress with a low cut back and bold red lips. 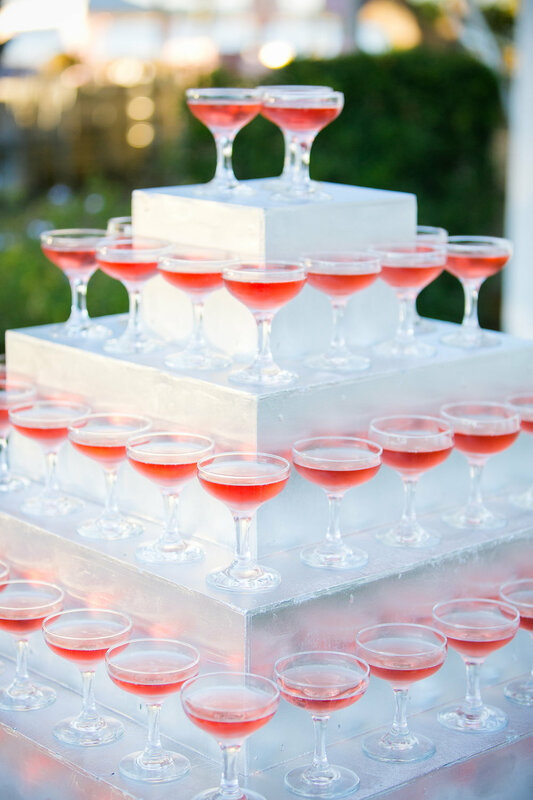 Following the ceremony, a pink champagne tower provided by Polished awaited the guests for cocktail hour. This wedding had a ladies and gents tents set up on either side of the dock, and looked the part. The ladies tent was covered with pink draping and inside a beautiful crystal chandelier hung above the feminine lounge with lip gloss, perfume, and a fun framed quote from Coco Chanel for the girls to use. 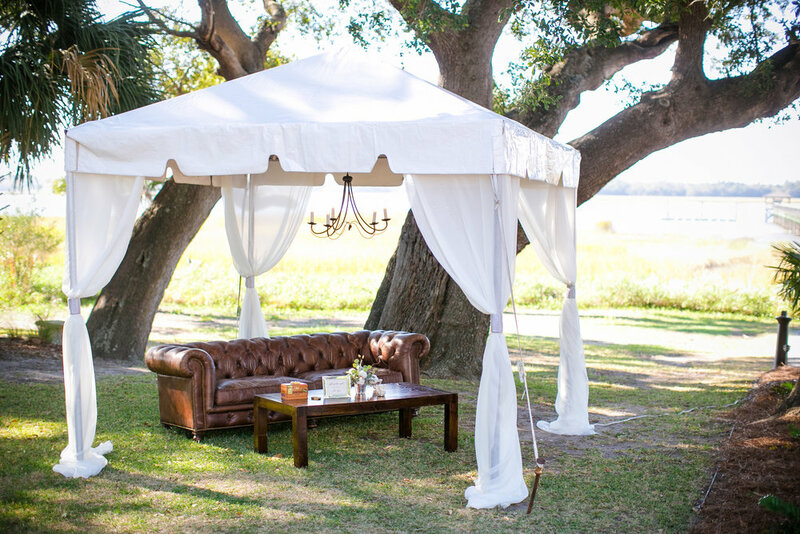 On the other side was the gents tent; it had a brown leather sofa, drum coffee table, and iron wrought chandelier to create the masculine vibe. Cigars were offered inside the tent for the male guests to enjoy. The couple danced the night away to the awesome Calvin Taylor Band and the couple rode off in a vintage Rolls Royce provided by ACW! You are in for a treat today! 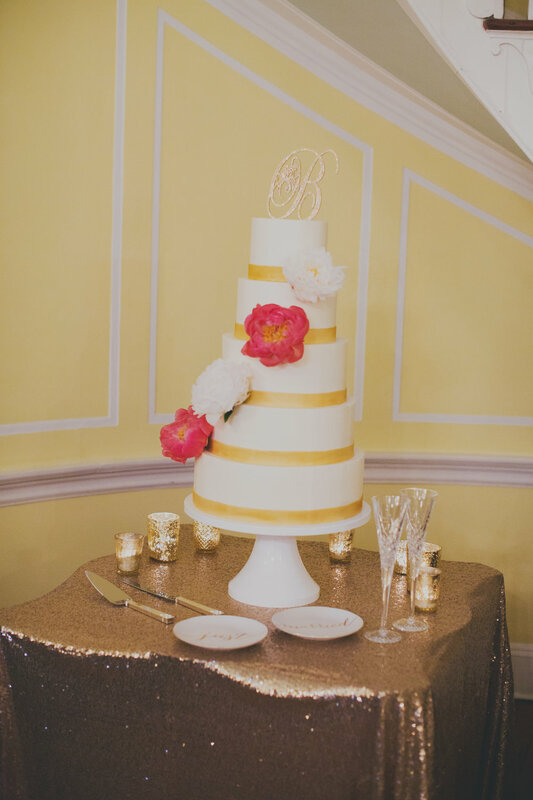 Jackie + Branson had a gorgeous Lowndes Grove Plantation Wedding with tons of pretty details! The couple met while attending law school at the University of North Carolina at Chapel Hill and later moved to Atlanta together after dating long distance. The bride loved the little details so for starters, there was a white top tent with blush draping and crystal chandeliers, of course! White and peach hued florals by Branch Design Studio, gold chivari chairs, glass chargers, and plenty of candlelight. For place cards, the guests found their seat by a mint colored macaroon with a gold sparkly flag noting the guests name, perfect after dinner sweet! A delicious dinner was served by Patrick Properties Hospitality Group along with a delicious cake gold brushed cake for dessert. Underneath the big Oak was the half moon bar, with the bride + groom's gold leaf monogram and a chandelier overhead, one of our favorite details of the big day! You can also find their monogram carried throughout the reception on their napkins, favors, menu's and more! After dinner, it was time to dance the night away with Quiana Parler and Friends and end the night with a sparkler departure! You can find this wedding recently featured in Southern Bride Magazine. 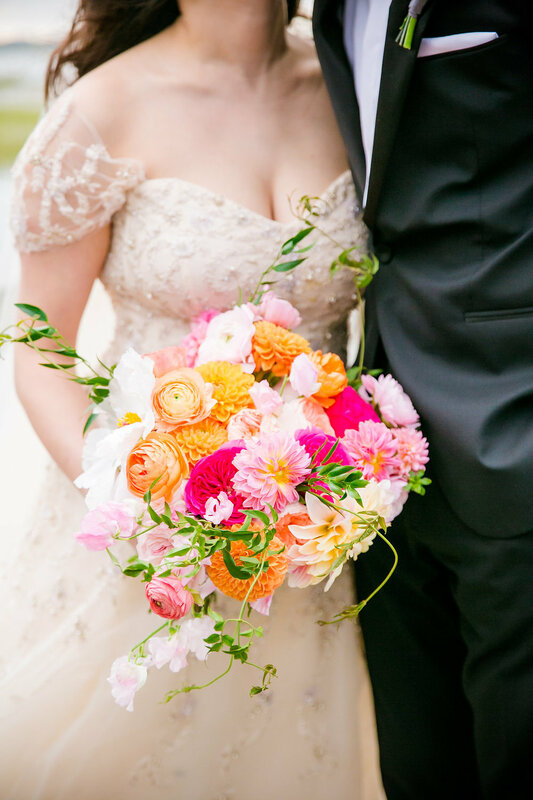 See all the pretty captured by Aaron and Jillian Photography here! We couldn't have asked for better weather to celebrate Gabby + Pedro'sLowndes Grove Wedding! 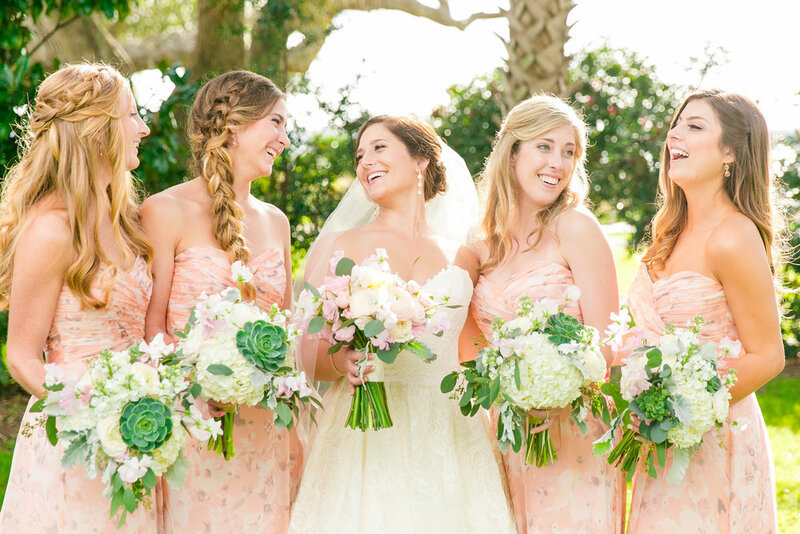 Gabby looked jaw-dropping walking down the aisle in her sweetheart ball gown from Modern Trousseau, and the bridesmaids complimented her look with pink floral watercolor-inspired dresses. Once the couple said their "I Do's" at Church of the Nativity, guests were giddy to head over to the reception and grab a cocktail and take in the water view. Blooming blush garden roses, sweet peas, and dusty miller in shades of pinks and whites with greenery adorned the tables outside and rustic seating and lounge were all too fitting for this sunny day celebration. The couple and their guests took advantage of the sunset and snapped some romantic pictures under the Oak tree with a handmade lit "Love" sign. As a favor, each guest was given a handmade box with benne wafers for a sweet treat. The couple danced the night away, Gabby's sister revealed a special guest: the Clemson Tiger, the bride and grooms alma mater! Guests cheered and chanted as the tiger joined them to dance and celebrate with the bride + groom to the tiger rag song. And of course, what better way to end the perfect night than with a sparkler send off! As Gabby + Pedro were whisked away in their limousine, we wished them a happily ever after! Despite the 1000 year flood that occurred the weekend of Katrina and Eoin's Lowndes Grove Plantation Wedding, this couple was determined to say "I Do!" Guests and family flew in from all over the globe, including family members from Ireland! The rain took a break for the sweet couple and allowed them to capture their first look photos under the oak tree on the lawn. After a romantic ceremony, guests were invited under the tent to enjoy their cocktails and hor d'oeuvres. The tent was filled with blush pin-tuck and satin linens intermixed among the tables.The sweetheart table stole the show with a blush sequined linen, and floral decorated chair backs. The gorgeous tabletop florals varied in height and sizes and included blush and pink roses, plum hydrangeas, sweet peas, and astilbe with accents of ivory and gold. Origami paper cranes in white, pink, and gold were set on the tables as place cards. Guests signed a jumbo bottle of champagne to give Katrina + Eoin their best wishes. After dinner, dancing was kicked off with Irish sing-a-long's! The bride + groom had picked specific songs and printed lyrics to be passed out to all the guests. PLB could not stop smiling as everyone was on their feet singing along to "Whiskey in the Jar." The dancing continued with the perfect mix of oldies and new hits! Katrina could not wait to change into her fabulous after party dress and finish the night out with a bang! The bride + groom ended the night by recognizing their shared love for the South Carolina Gamecocks. Guests were given rally towels to wave in the air as the fight song, "Sandstorm", played. We were so excited that the weather held out for this wonderful couple! Jaclyn + Oliver's Lowndes Grove Plantation wedding was a gorgeous Southern celebration full of coral, gold, and seafoam green accents! 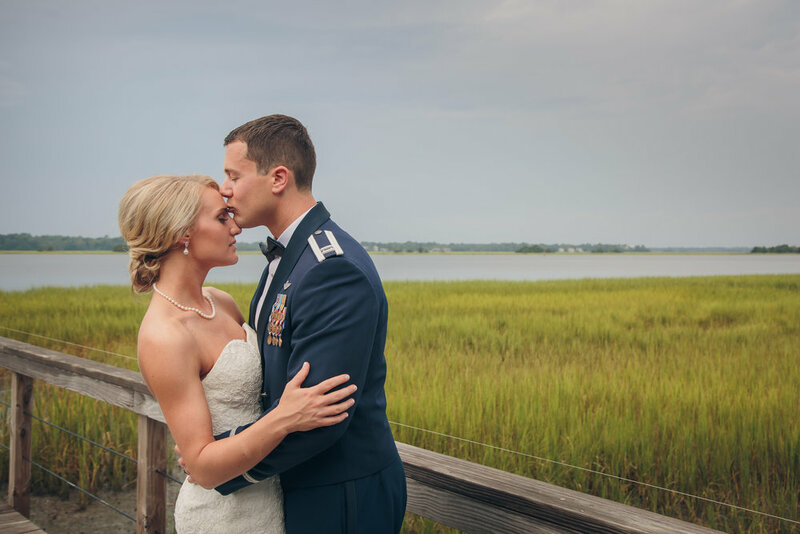 This local couple decided to pay homage to their city and tie the knot in beautiful Charleston with the Ashley River as their backdrop. 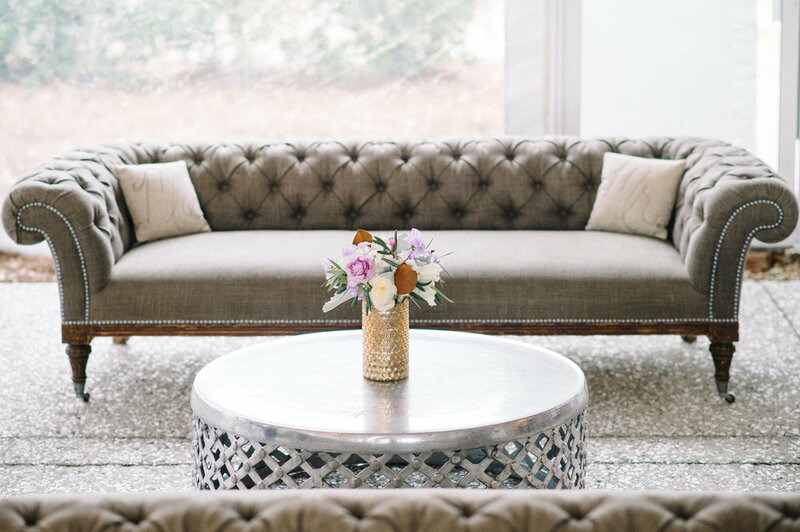 The day began in the Lowndes Grove suite where Jaclyn and her girls got their hair and makeup done by Paper Dolls while sipping mimosas and relaxing pre-nuptials. When the girls were all glammed up, Jaclyn and her father Don shared a very special father and daughter first look. This is a great alternative if you and your groom opt out of the first look! 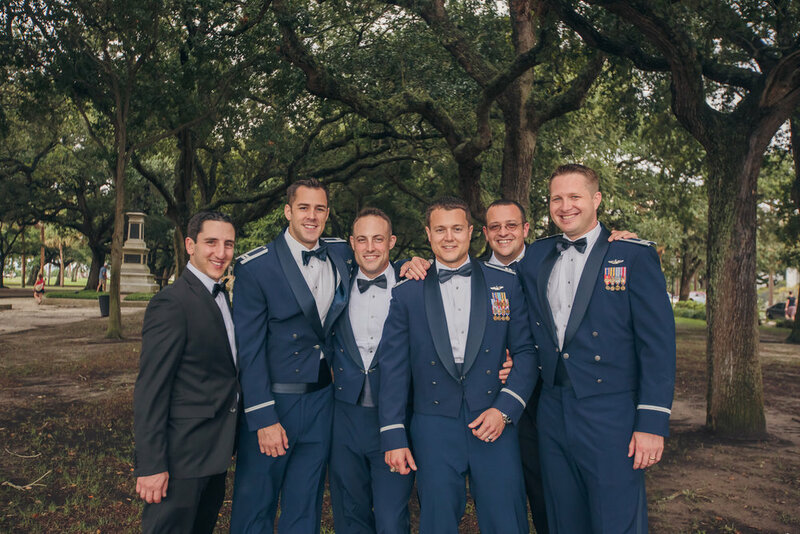 Once Oliver and his groomsmen arrived on site, Jaclyn was tucked away while everyone lined up for the ceremony. 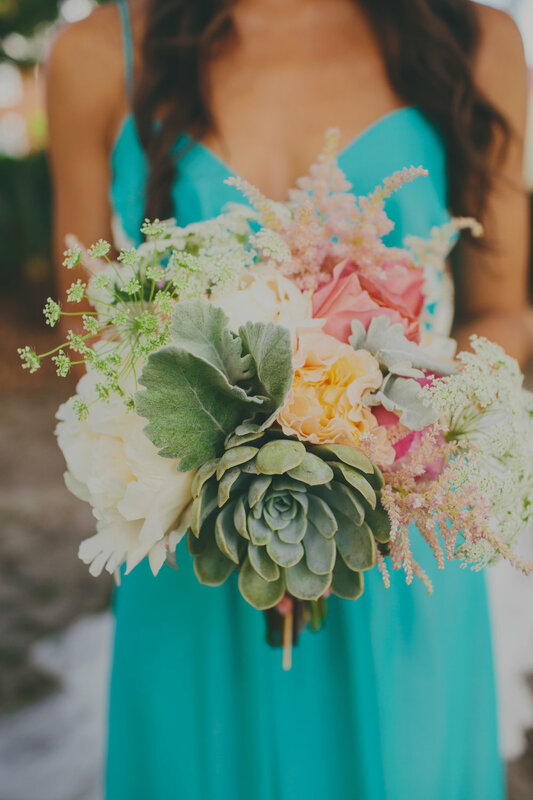 Jaclyn carried a lush bouquet filled with green succulents and coral blooms, tied together with lace and seafoam green ribbons. Oliver's mouth dropped wide open when he saw his stunning bride gracefully walk down the aisle. The soon-to-be newlyweds stood beneath a beautiful floral arbor of garden roses, lisiantus, and succulents as they said their vows in front of their closest friends and family. After Jaclyn + Oliver tied the knot, cocktail hour kicked off under the tent! Elegant long tables filled the room with mahogany chivari chairs. The tablescape was complete with gold rimmed chargers, gold silverware, coral napkins, custom menus, lush blooms and greenery, gold lanterns, and custom gold pineapples! These gold spray-painted pineapples were a hit. A symbol of Southern hospitality and welcome, these gold pineapples were incorporated throughout the wedding on the couple's koozies, as small cake toppers, and as garnishes on the passed hors d'oeuvres. 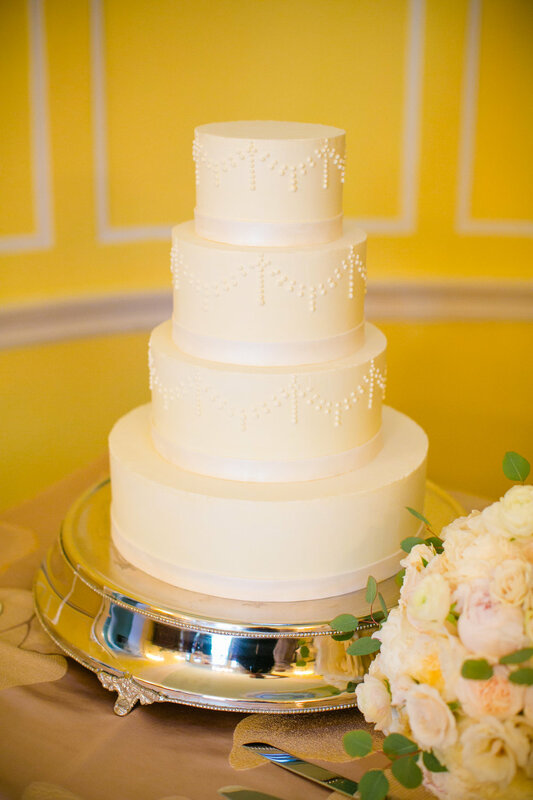 The seafoam green cake was another focal point in the room, complete with gold flecks and Jaclyn + Oliver's initials. 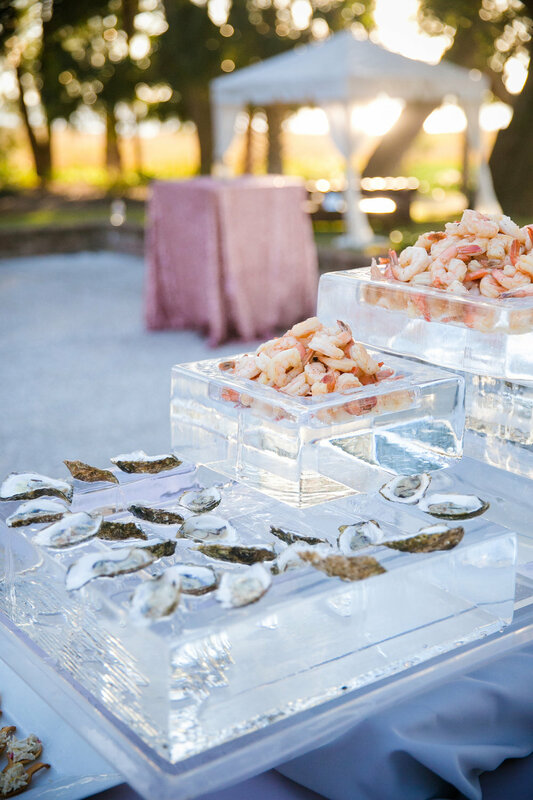 Guests were treated to a delicious stationed meal, a custom gelato bar at request of the groom, and dancing the night away to the sounds of Charleston Groove Factory. This band kept guests on their feet all night long! Friends, family, and the elated newlyweds danced to "Somewhere Over the Rainbow" before Jaclyn + Oliver departed under an archway of sparklers into their getaway vintage Rolls Royce. We so enjoyed working with this couple on their gorgeous Southern design, and we're not soon to forget those gold pineapples! Wishing Jaclyn + Oliver years of health, happiness, and love. 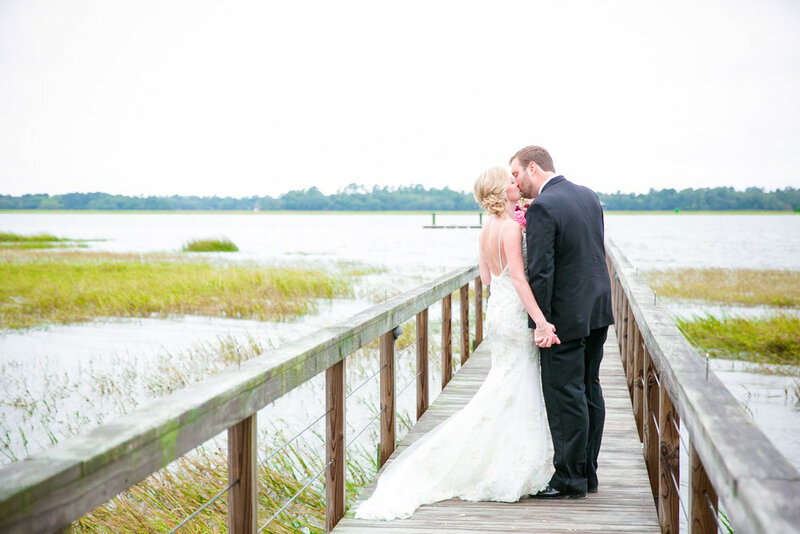 Katie + Matt's Lowndes Grove Wedding was a beautiful warm summer day! The couple said their "I Do's" at the historical Cathedral of St.John the Baptist on Broad Street in downtown Charleston. Guests then moved over to Lowndes Grove Plantation for cocktail hour complete with a raw bar and yummy eats, followed by the reception adjacent to the house. The tent was accented in navy and white, with lovely blooms by Wild Flowers Inc. In lieu of a typical table number, the couple named each table according to popular streets in Charleston, we just loved this unique idea! Since the groom was in the airforce, for their grand departure, the bride and groom walked through a tunnel of paper airplanes! The perfect end to the evening all captured by Richard Bell Photography! 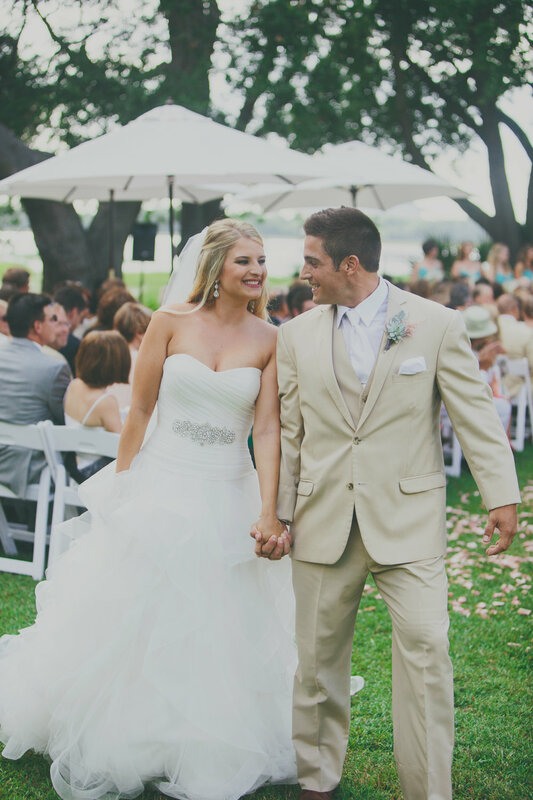 Stephanie + Chad's classic Lowndes Grove Plantation wedding couldn't have been more perfect! These out-of-owners traveled from North Carolina to have their dream wedding in Charleston at the picturesque Lowndes Grove Plantation. Stephanie looked breathtaking in her Modern Trousseau gown as she walked down the aisle of St.Lukes chapel with her father to "Rondeau" by Mouret. 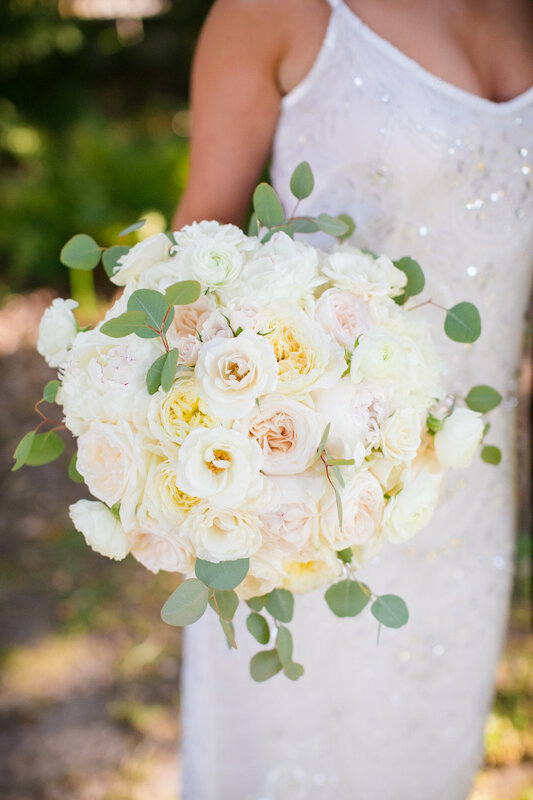 Her lush bouquet was full of white peonies and white ranunculus with accents of dusty miller, lavender sweet peas, white fringe tulips, white patience garden roses, and more! As guests began to arrive at Lowndes Grove for the reception, Stephanie + Chad warmly welcomed them into the house for cocktail hour while guests enjoyed delicious sips and bites. The clear tent was gracefully draped in ivory with chandeliers glistening from the top. At each place setting, guests found their names written in gold calligraphy on Magnolia leaves with sprigs of rosemary, olive, and lavender accenting each napkin. Long table garlands full of magnolia leaves, olive branch, and seeded eucalyptus filled the tables, with colorful pops of white fringe tulips, white ranunculus, and lavender sweet peas. Gold silverware, gold rimmed glasses, and custom menus by Silver Starfish completed this elegant table setting. Guests enjoyed a delicious 3 course plated dinner while the sounds of big band music by Joe Clarke Big Band flooded the tent. This fantastic night had to come to an end, but not before guests enjoyed a variety of mini desserts and one more song by the band before departing in the vintage Rolls Royce! Thanks so much to Aaron and Jillian for capturing all this pretty and best wishes to the sweetest couple, Stephanie + Chad!